Pros: A good overall quality of writing, and some really terrific chemistry. Cons: Some of the pieces show a triumph of idea over execution. Like last year, this night of new writing offers fresh work in a fun format. Though not quite as special as previous incarnations, the night offers some great moments. Last year’s version of The Collective Project was actually my trial review for Everything Theatre, so it’s safe to say I was feeling a little nostalgic when I rocked up to the Camden People’s Theatre. I was also feeling excited, because last year’s show packed some serious punch. If you aren’t familiar with the idea of the show, and didn’t read my review of it last year (shame on you!) then I’ll break it down for you: eight writers, eight directors, twelve actors, and twelve days to create the work. The theatre company behind the evening, The Pensive Federation, also handed out eight collective nouns to inspire the plays. The result is, as you’d expect, a mixed bag. Although The Pensive Federation do attempt to steer the ship somewhat with workshops, and assembling a group of writers and a cast with a 50/50 gender split, what each play amounts to is largely going to be a result of its individual components and there are a few weak links. The topics of the plays ranged from Black Friday in Martin Malcolm’s somewhat clunky Squad to game shows in Isla Gray’s sharply observed Audience. 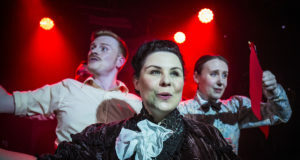 There is no sense that the evening relies too heavily on either comedy or pathos, with every play drawing upon both in some way, keeping the evening interesting and the audience on their toes. This notion of the audience being made to work was most predominant in Alan Flanagan’s Chapter, where we had to piece together what happened on a teenage night on the town gone awry as the characters feed it through to us in dribs and drabs. The talking heads style and fractured narrative was unusual and it felt rewarding to participate in the mystery à la podcast-of-the-moment Serial. However, the story never quite overcomes the lack of visual interest (although it gets close) and it lacks a final punch. Flanagan’s sense of storytelling however is there though, which other pieces lack. Some feel a little plodding or not properly paced. Guleraana Mir’s Bench, for example, introduces some unique and compelling characters but never quite gets anywhere with them. All in all, it feels like the first ten minutes of a play, not a complete piece in itself. Similarly, Murmuration feels like a fly-on-the-wall documentary rather than a short play. Saying this, there are some moments of pure brilliance in the writing, especially in the final piece of the night Host where Camilla Whitehill’s brutally honest script is showcased with some perfectly measured performances. Indeed much of the second act crackles with the energy and chemistry of the cast, so much so that many weaknesses in the text or direction are smoothed over. 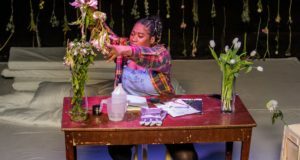 For a set of eight plays to be created in just twelve days is impressive, however they come across, and the decent overall calibre of The Collective Project makes it even more laudable. So, even though this evening didn’t quite meet my (admittedly high) expectations, it was still a charming way to spend a cold winter’s evening.